India, the 18th largest export economy in the world, exported $292 Billion, and imported $421 Billion, worth of goods in 2014, resulting in a large negative trade balance. 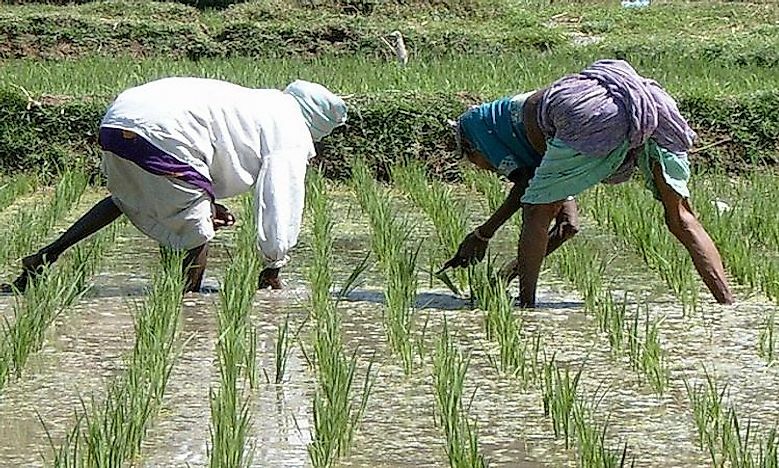 Farmers tending to rice fields in India. Rice is among the top items exported from the country. India, the 18th largest export economy, exported $292B and imported $421B worth of goods in 2014, resulting in a negative trade balance of $129B. India is the second most populous country in the world with a large pool of labor and efficient government reforms has been reshaping the world’s economy. India’s economy has been consistently growing at an average growth rate of 7% per annum for several decades. India’s top trading goods include petroleum, agricultural produce, precious stones and jewelry, and machinery. Refined Petroleum, at $53.9B, is India’s chief export. While India’s crude oil production is low, the country’s refining capacity is large, and it exports refined petroleum to oil-producing countries such as Saudi Arabia and UAE as well as countries in Europe. Packaged Medicaments are exported at a value of $12.1B while jewelry accounts for $11.8B of the total value of exports. India has one of the largest cutting and polishing industries for diamonds and other precious stones in the world. The industry is highly export oriented, and it is underpinned by an abundance of specialized labor. India, having a substantial agricultural economy, exports rice at a value of $7.75B. The manufacturing sector in India has been on an upward trajectory in the recent years, and cars account for $5.82B of the country’s total exports. India does not have major oil fields and depends on imported crude oil to supplement the high level of expertise in oil refinery. Crude oil is, therefore, the main import at $122B, imported from some of the world’s giant oil producers. Gold and diamond are imported at $31.1B and $17.5B respectively, to fuel the country’s gems and jewelry industry. Over 90% of the global diamond gets cut and graded in India because of the low cost of labor and expertise. Petroleum Gas and Coal Briquettes are imported in India at a value of $17.7B and $15.4B respectively. Key export destinations for India lie in Asia, Europe, North America as well as the Middle East. The US is India’s largest export market, exporting goods valued at $35.9B. The principal goods shipped to the US are diamond, medicaments, rice and other agricultural produce, and oil. The UAE is the second export destination at $29.6B with the primary products being jewelry, refined petroleum, coal products and rice. China imports goods valued at $13.9B from its Asian counterpart through a bilateral trade framework. The exported goods include iron ore, cotton yarn, organic chemicals, plastics and refined copper. Saudi Arabia imports products such as rice and other vegetables and fruits, oil, textiles, machinery and automobile, iron and steel among other goods valued at $13B. The UK imports from India goods valued at $10.6B, with the primary products being clothing, machinery, and agricultural produce. China is the largest exporter to India at $52.5B, with the major goods being electrical and machinery, nuclear reactors, organic chemicals and oils and mineral fuels. Saudi Arabia and the UAE export $30B and $24.4B respectively, the principal product being crude petroleum. Switzerland exports goods valued at $21.3B including gold and precious stones, nuclear reactors, boilers, pharmaceutical products, machinery, optical photography machinery and electrical machinery. India imports products such as precious stones, machinery, electrical machinery and aircraft among other imports from the US at a value of $18.2B.